It was Mothering Sunday when we walked through the churchyard – just a short cut from muddy field to lane. The service was over, a solitary banner fluttered in the March chill. “He didn’t open a text book all half term,” I said. I know you would have given me these yourself if you could. This is part of the Friday Fictioneers writing group – where writers from all over the world write about 100 words using a photo as inspiration. This week Rochelle has chosen one of my photographs. 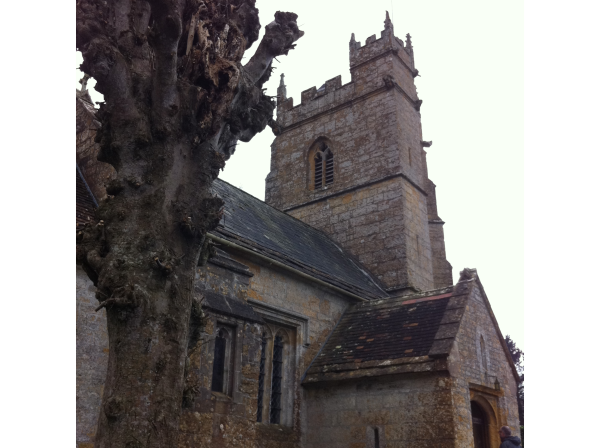 It is St Thomas a Beckett church in South Cadbury, Somerset. Click here to see more pictures if you’re interested. Lots of other writers have written very short stories inspired by this photograph; click here to read other people’s and to join in. And please comment below with any suggestions for improvement on my story. Also for any Americans reading, I’ve written a blog post with some questions specifically for them. Click here to have a read and see if you can help with any answers. Great photo inspiration – thank you! And a lovely story to go with it! Thanks Ron. We had an amazing honeymoon and will definitely be returning to America. A moving reminder, Claire, and a beautiful photo – thank you. I love how you depict the relationship between Mum and Dad, and his gentleness over her worrying. I think you want a capital on “Don’t worry,” and in terms of concrit, the only other thing which stood out was the “he’ll get into University” felt a little bit unrealistic. I know you need it there to explain the story but I wonder if there’s a smoother way to do that. A tiny thing in an otherwise rounded piece. Thanks Jen. And I really agree with your point – putting words in characters mouths for the sake of information for the reader isn’t a good thing. I could have simply written ‘he’ll get in’, but I wasn’t sure how clear that would be. Perhaps I’ll change it and see whether I get lots of comments saying eh? Thanks Rochelle. I’ve just been busy – I’ve definitely missed doing my weekly 100 words. So all it takes to have you grace these pages is to use one of your photos? (Thanks. It was a lovely prompt.) Jennifer nailed my thoughts on the head, so I’ll hush now and only add that I enjoyed your writing very much. Hah! I promise that it was coincidence! I’ve been away for a couple of weeks, and book-busy apart from that. But I’m very pleased to be back. Absolutely. There are nearly always worse things than the things we worry about. Claire, I liked this prompt very much. It reminds me of the remnants of an old church on the way to Estes Park, CO. Your story touched me. I have a son whom I was concerned wouldn’t get into his college of choice. I can picture the mother pausing at the grave, her angst, her fear, her relief. Nicely done. Thanks Honie, glad you could identify with it. Very moving, putting things nicely into perspective. Thanks Sandra. Easy to let our worries get carried away. Although I had to read it twice to be certain, i found it very neatly done, charming and sad. Thank you. I hope you didn’t have to work at it too hard. Loved the picture… and somehow it toeld me a story directly…. Reading through the comment made me understantd the story. The note at the grave was so touching..
I’m a little behind with my replies but thanks Bjorn. Thanks for sharing your photo with us, it allowed many interpretations. I liked your story, you made the situation clear with few words to work with.